Nitrogen has been a hot topic of discussion in Grainews for more than 35 years. In recent years there has been a great deal of hype about the 4Rs when planning fertilizer use: right source, right rate, right time and right placement. 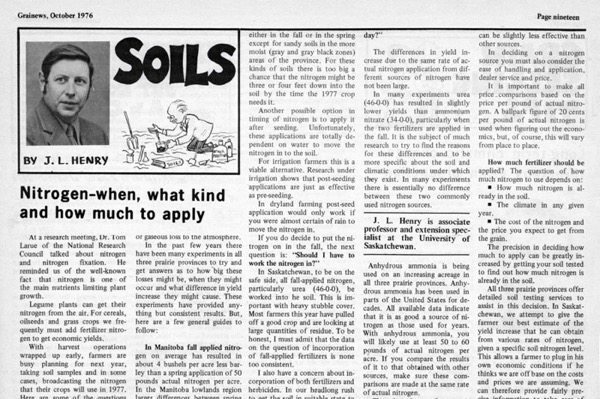 The first Grainews column I penned was in October 1976: “Nitrogen — when, what kind and how much to apply.” Back then, phosphorus was seed placed and nitrogen was broadcast except anhydrous, which by necessity was banded, so placement was not an issue. And, in those days the best nitrogen fertilizer was still available — ammonium nitrate (AN) NH4NO3 34-0-0. Ammonium nitrate provided the quick action of the nitrate and the stability of ammonium in one prill. It could be broadcast with safety. Fall broadcast in Red River Valley and other wet areas could be a problem because of gaseous losses but otherwise it was a winner. But ammonium nitrate was expensive to produce and plants had environmental issues. The explosion hazard and criminal activities put the boots to it. Too bad. The fourth R came about when urea came on the scene. Urea was broadcast just like AN but did not act the same. Gaseous ammonia loss was (and is) a problem. The remedial action of the day was incorporation. Not immediate like Treflan but without much delay. We recommended doing the incorporation within a day or two of application. Now it turned out that Westco did not market anhydrous at that time and anhydrous was giving urea a licking in the market place. Along came John Harapiak (1937 to 2011). He was a Westco agronomist and started an extensive series of trials all across the west comparing broadcast to deep placed urea. Lo and behold, if you treat urea like anhydrous and put it four inches or so in the soil, it reacts the same. The emphasis is on deep. Recent work by John Heard and others in Manitoba has shown that shallow banding of urea can be worse than broadcast in terms of volatile loss. In hindsight and contemplating the theory of it all, it makes sense. When urea is shallow banded the NH3 concentration and pH skyrockets — just as it does when we inject anhydrous ammonia. We all know what happens if we try to band anhydrous an inch or two deep. The realities of acres and time has led to a return to broadcast urea. But, in recent years we have had much wetter conditions and the probability of a rain soon after broadcasting is much greater than the years when the original work was done. If urea is broadcast and an inch of rain comes along in a day or two, all is good. Urea on a totally dry surface will just sit there. But a dry surface does not stay dry for long. A very heavy dew or few sprinkles will be enough to juice it up and lead to gassing off. Much of the nitrogen is now side banded or mid-row banded. Providing the band is far enough from the seed and deep enough it is a great option, but a lot of tendering at seeding time. To digress — the big farmers that make it all happen are the ones driving around in their pick up and communicating with their smart phone. Decisions are made on the spot and plans change by the day or even hour. Big operations making decisions in remote corner offices of big cities will never make it — recent events have proven that yet again! I still favor anhydrous ammonia. It is usually the cheapest, is most concentrated for transport and rests comfortably at four or so inches depth until a plant root finds it. The entry of Agrotain and ESN has added some choices to the mix. From any research I have seen the products perform as advertised, in terms of the reactions in or on the soil. Whether or not they are a fit will depend on your operation and farm conditions. Broadcast Agrotain does add a window of a couple of weeks. Seed placed urea can be a disaster at high rates and ESN buffers that to a significant degree. The best time and place to have adequate NO3 and NH4 is when a plant root comes looking for it. Spoon feeding through the year is great in theory but only in practice for irrigation farmers. Green Seeker and dribbled solutions sounds good to me but I’m not sure how much data is available to prove it. Perhaps readers will enlighten me. Spring is better than fall in theory. In practice I like anhydrous in the fall. Then the big job is done and we can concentrate on seeding in spring. Also, in dry springs the tillage associated with applying anhydrous can dry out the seed bed — a problem especially for canola. The right rate is a matter of a good and continuing soil testing program. Variable rate nitrogen has much hype but I have seen few examples where it is working. The big limitation in nitrogen soil testing is the need for a measure of mineralization. There are many research papers and computer programs to estimate mineralization. For years I have thought it is as simple as taking a moist soil sample in fall and leaving it at room temperature for three to four weeks and then measuring nitrate. Alas — no one is listening. The rationale is this: if it does not mineralize in a few weeks at room temperature and field capacity moisture, then it will not mineralize in field conditions to be any good to the current crop. Procedures for measuring “potential nitrogen mineralization” have been known for decades. It involves a complicated lab procedure including incubation at 35 C for 30 weeks. I fail to see what relevance that has to what will happen at my farm between June 5 and July 20. In most years that is about the time most nitrogen will be sucked up by roots and pushed above ground. The 4Rs are just fine but its does not mean there’s a recipe for any given farm, crop, or year.